Andre Nagtegaal - Two thumbs up for peace, mon,....'power' to that, swa ! Two thumbs up for peace, mon,....'power' to that, swa ! 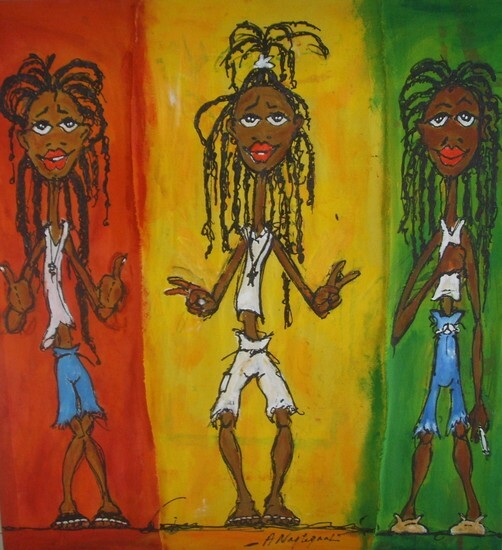 3 Rasta's. 1 from Jamaica, gesturing 2 thumbs up, the other from the States depicting the 'peace' sign and the third one from Curacao is signaling the end gestures after giving the 'power' salute, typical with Antillean encounters. The painting is 3 layers of lose canvas on 1 frame. Together they form the phrase : 'Two (2) thumbs up for (4 finger) peace, mon,....'power' to that, swa !